Doors used for emergency exits and fire escapes are mostly hinged doors and MUST ALWAYS OPEN OUTWARDS. These doors may be required by regulation to resist fire for a certain length of time, such as 30 minute, 60 minute and 120 minutes. The resistance time required will depend on where the door is situated, the processes or goods stored in the area, and other risk-related factors. Final Exit doors (exterior fire escape doors) are often not fire rated, assuming there are no special risk or flammable processes in the area of the door. The door which separates a factory from an office area is usually fire-rated between 30 and 120 minutes depending on the risk-factors in the factory. The purpose of that door would be to compartmentalise the building to stop the spread of fire and smoke between the factory and the office – to quote a common example. The door between a house and the garage is usually rated at 30 minutes. Smoke is a big killer – many victims succumb to smoke inhalation, lose consciousness and die long before the fire reaches them. This is the reason why automatic door closers are used to keep fire exit doors closed. This prevents the ingress of fresh air which fans a fire and circulates smoke throughout the building. In addition, a fire exit door which self closes and locks itself will prevent opportunistic intruders entering from the outside after escape has take place. See Door Closers page for more information on how to keep doors closed. Fire Doors can be ordered from The Lockshop made-to-size. Fire Rated doors are supplied ready-mounted in Fire-Rated frames – ready to be built-in. Please furnish the opening size and the thickness of the walls when ordering. 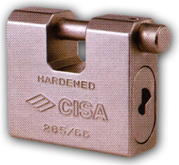 Hardware for Fire Doors go to our Panic Hardware page.